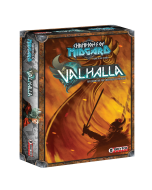 The Dark Mountains is the first expansion for Champions of Midgard. This expansion extends your adventures to distant lands, allowing you to trek into the dark mountains, where the Bergrisar live and wage constant battle with the Archer Clans of the North. 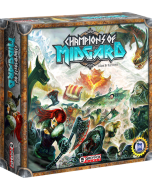 Champions of Midgard: The Dark Mountains adds a ton of new content to the base game, including the ability to play with up to 5 players. The Expansion includes new land journeys, a new Enemy type (Bergrisar), more powerful Trolls and Draugr, as well as additional Rune Cards, Market Tiles, and more.